Guilty as charged – until last weekend’s visit to LACMA, I was not aware of a new, important exhibition there: 50 Kitchens by well-known Los Angeles artist, Mark Grotjahn. His 50 large-scale “Butterfly” pencil drawings were conceived as one work and exhibited for the first time. The size of each drawing was made to meet the dimensions of a wall in Grotjahn’s kitchen, hence the title of the whole work, 50 Kitchens. 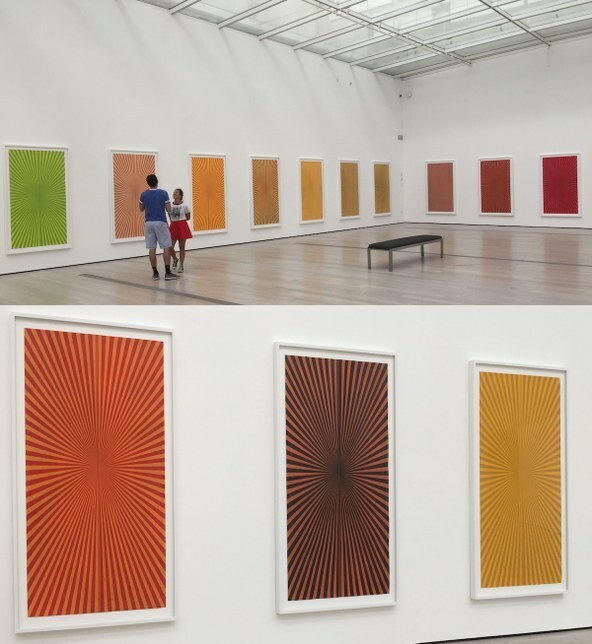 Top and Bottom: Installation shot, 50 Kitchens by Mark Grotjahn. LACMA. Photos by Edward Goldman. The exquisite colors, amazing craftsmanship, and patience that went into producing this work is rather remarkable. But, I have to admit that after examining the first few drawings, I started to feel less and less engaged. No matter how beautiful the exploration of color demonstrated in these drawings, they started to come across as a touch formulaic – even obsessive. Which brings to mind the memory of another LACMA exhibition under the skylight in the same galleries. 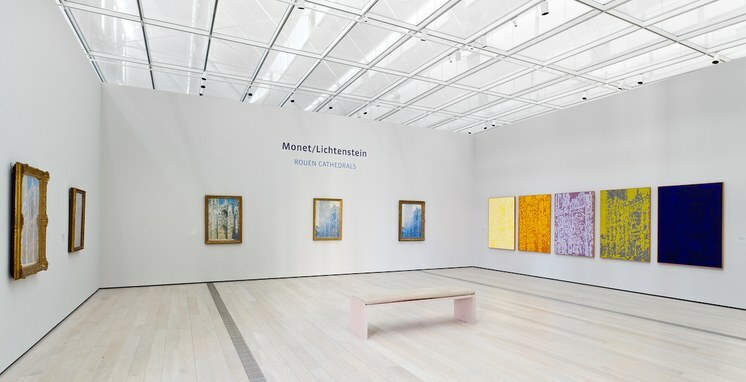 In 2011, LACMA managed a near-impossible task, to pair and juxtapose 5 paintings of the Rouen Cathedral by Claude Monet with 5 paintings by Roy Lichtenstein inspired by Monet’s Rouen Cathedrals. 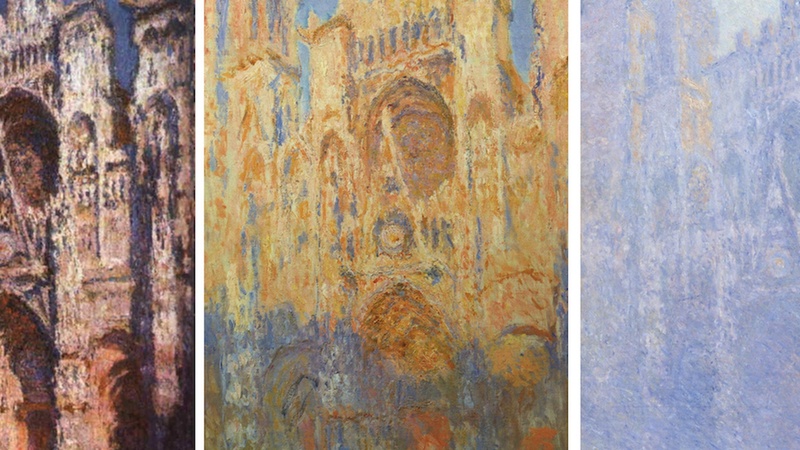 Left: Rouen Cathedral, Monet. 1894. Image courtesy Wikimedia Commons. Middle: Rouen Cathedral Façade, Sunset, Monet. 1892-94. Image courtesy Wikimedia Commons. 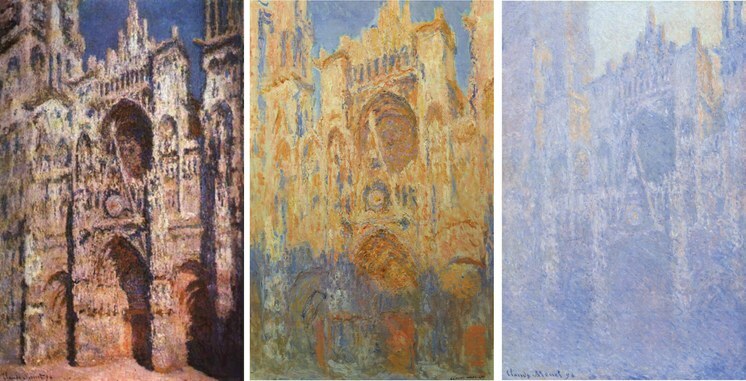 Right: Rouen Cathedral, Façade, Morning effect, Monet. 1892-94. Image courtesy Wikimedia Commons. Lichtenstein was inflicted by the same obsession as Monet, and created 18 paintings, 7 study drawings, and 8 prints on the same subject. Somehow, I am glad that LACMA’s Monet/Lichtenstein: Rouen Cathedrals exhibition contained only 5 works by each artist, with emphasis on their inspiration versus their obsessions. 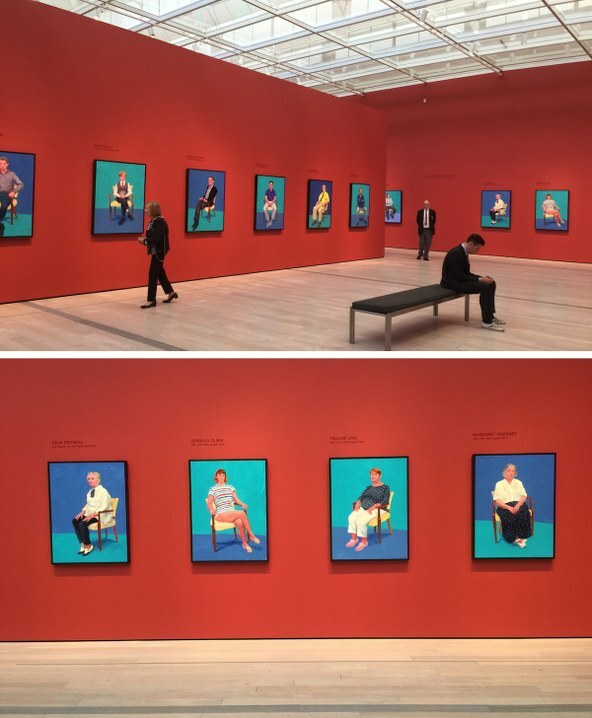 Top and Bottom: Installation shots, 82 Portraits and 1 Still-Life, David Hockney. LACMA. Photos by Edward Goldman. As a coincidence, or maybe not, Grotjahn’s 50 Kitchens are shown next to David Hockney’s exhibition, 82 Portraits and 1 Still-Life. All of the portraits were completed within a span of 3 years; each in the same setting, in the same chair, and finished over a short period of 2-3 days. They come across as a touch formulaic. I know quite well some of the people painted by Hockney, and it seems to me that the artist didn’t explore their unique characters. I wonder, if the artist had allowed himself to spend more time on each portrait, would he have captured more than just a likeness? 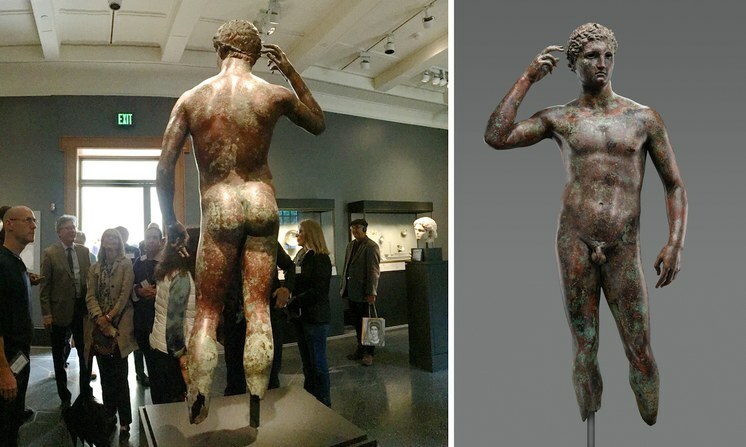 Left: Back of Statue of a Victorious Youth, 300-100 B.C. Bronze. Getty Villa, Los Angeles. Photo by Edward Goldman. Right: Statue of a Victorious Youth, 300–100 B.C., Bronze with inlaid copper. The J. Paul Getty Museum, Los Angeles. Image courtesy The Getty. Talking about obsession… last week, both the New York Times and the Los Angeles Times wrote articles about an Italian court, once again, ruling that the famous Getty bronze Statue of a Victorious Youth should be repatriated to Italy. This legal battle has been going on for 40 years. Because the sculpture was found by Italian fishermen in international waters, it legally has no archeological connection to Italy. But, that hasn’t stopped the Italians. If only our Italian friends would apply the same vigor trying to resolve the myriad problems plaguing their own museums, which are suffering from overwhelming bureaucracy and perpetual lack of funds. Several years ago, embarrassing news came from Pompeii, where a portion of an ancient wall collapsed due to chronic neglect.